An eye-opening proposal to kill the local school property tax in order to force Texas lawmakers to build a new school finance system won unanimous approval Thursday from the House's tax-writing Ways and Means Committee. Okay, there is a way for the Texas Legislature to lower your property taxes after all. The House Ways and Means Committee — the Capitol’s wellspring of tax bills — voted unanimously Thursday to let voters decide whether to eliminate the property taxes that raise about $24 billion per year for public schools. All that would be left is to figure out a way to pay for public education without the money. Burning down the schoolhouse, as it were, would force the state to build a new one. Here’s the thing: The state doesn’t set property tax rates or appraise properties. That’s left to local government. But state officials do affect property taxes in an indirect but meaningful way by raising or lowering what the state spends on public education. The greater the state’s share, the smaller the local share. The smaller the local share, the lower the local property tax bills. 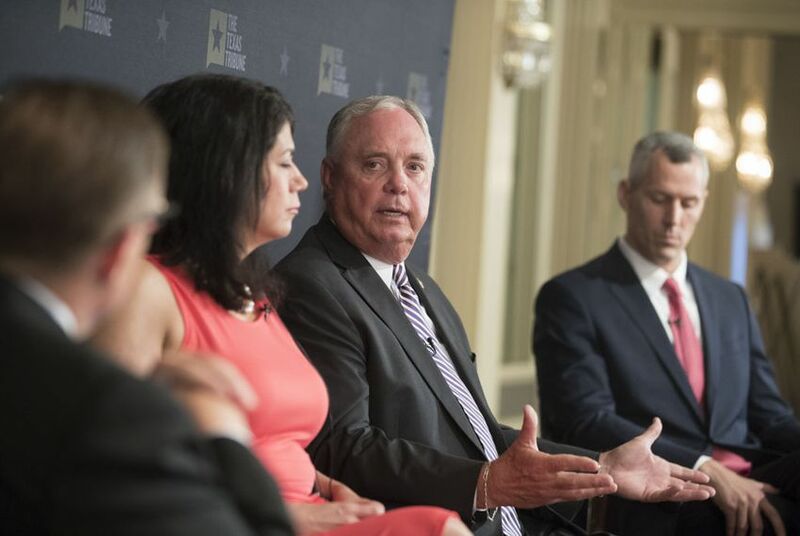 Until this week, pending property tax legislation touted by your elected public servants in Austin would limit future increases in property tax increases by cities and counties but wouldn’t cut them. Your tax bill would still grow, perhaps — but not certainly — at a slower rate of speed. Killing the school property tax altogether, whatever else you might say about the idea forwarded by state Rep. Drew Darby, R-San Angelo, would cut your bill by eliminating the single biggest item. More to the point, it illustrates one of the few ways lawmakers have to actually ease Texans’ property tax woes. Burning down the schoolhouse, as it were, would force the state to build a new one. Before you uncork the good stuff to celebrate, remember that most Texans still want public education in the state. Getting rid of the property tax would force lawmakers to replace it with something else — presumably, by some kind of tax levied by the state itself. Every local dollar would be replaced by a state dollar. Legislation from state Rep. Donna Howard, D-Austin, would require the state to cover at least 50 percent of the cost of public education — up from the 38 percent it pays now. Another remedy, proposed by state Rep. Andrew Murr, R-Junction, would raise state sales taxes enough to cover the difference — to 12 percent from 6.25 percent. With local add-ons, that would make the sales tax 14 percent in most parts of the state. Texans would have a whole different tax to whine about and a really good reason to shop more on the internet and in New Mexico, Oklahoma, Arkansas and Louisiana. The only other piece of legislation that would put downward pressure on local school property taxes — a $1.9 billion school finance bill offered by state Rep. Dan Huberty, R-Houston — looks like a nonstarter in the Senate, where Lt. Gov. Dan Patrick has said the measure’s method of finance resembles a Ponzi scheme. To be fair, Patrick was still stinging from the House’s comparison of the Senate’s transportation spending to the way things were done at Enron. Without spending more money on schools and lowering the need for local school taxes, the list of state remedies for the most-hated tax is short. Voting to kill the school property tax might sound good in the primary elections, too, when incumbent legislators are pressed by taxpayers seeing red over high bills. Darby’s brinksmanship probably won’t get far. It’s in the form of a constitutional amendment, requiring 100 votes in the House and 21 in the Senate and then approval from Texas voters. And it would force a very conservative Legislature to conjure up a tax bill big enough to raise some $2 billion every month, which is what local property taxes raise now. At least it’s honest property tax relief. You might be paying till it hurts out of some other pocket, but the biggest part of your property tax bill would go away. The House, led by Speaker Joe Straus, has been trying to open the school finance debate all year. During the regular session, the Senate responded with a smaller proposed increase in state spending, attached to a school voucher bill the House won’t abide. Maybe Darby’s cataclysm will stimulate the conversation.